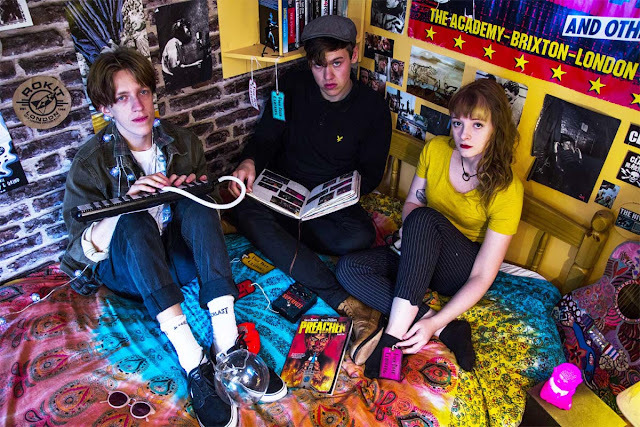 Every year at Glastonbury we tend to try and see the up-and-coming acts perform, because sometimes that's where the most exciting bands hide, and when we popped along to see Bury St. Edmund's Gaffa Tape Sandy we were pleasantly surprised. The trio craft upbeat garage-rock anthems with a slight hint of punk to give their tracks more punch, and when they performed their single "Water Bottle" at the BBC Introducing tent the band went from an unknown to me to one of the highlights of my festival. The new cut is only 85 seconds long but certainly packs a lot in, rip-roaring guitar and bass riffs, hectic drum patterns and will certainly make you want to lose yourself in a pit! The track certainly sounds like it's got a lot of power behind it and can easily turn you into a super-fan within it's 85 second running time. Gaffa Tape Sandy are just at the beginning of their existence, but if they keep up creating tracks like this they'll be known by all very soon! After signing to AntiGen Records towards the end of the year this clearly shows a statement of intent from the band, we just can't wait to hear more from this trip-roaring trio. Their last single of the year "Beehive" premiered over on Clash Mag and was greeted with praise from all over the world getting them even more fans, 2018 is certainly going to bring more material, we can't wait!